Christmas Is Coming! | Just Create! Spike Strikes Again! Quick, Easy & Beautiful! OK, I love Christmas! No, I LOOOOOVE Christmas! This is my favorite time of year, hands down. I love the cold weather, the lights, the decorations, the music, the gift buying and giving (although I don’t like wrapping! ), the crafting, the baking and cooking, the times with family and friends, and the whole meaning of Christmas and why we celebrate. So, I usually start early in the year thinking of new things for my house or for gifts. I already showed some needle felted snowmen I made. And I have more! In August (on my birthday! ), Knitpicks had a big warehouse sale. I am lucky enough to life 30 minutes away, so I dropped the kids off with my Dad and Stepmom (who live 3 minutes away!) and headed over for the craziness. I actually went for the yarn, but ended up enjoying it more for the fabric (from their sister site, Connecting Threads.) While I was standing in the long line to pay, I happened to see a fabric kit that caught my eye. It was in Christmas colors and, although I couldn’t see what it was, there was a pattern included. I grabbed it and was THRILLED! It was my favorite find of the whole trip! I can’t tell you how much I paid because you paid for fabric and yarn by the pound, but I am sure it was ridiculously little for the actual kit. I couldn’t wait to dive in! I LOVE IT! I love snowmen and snow anyway. 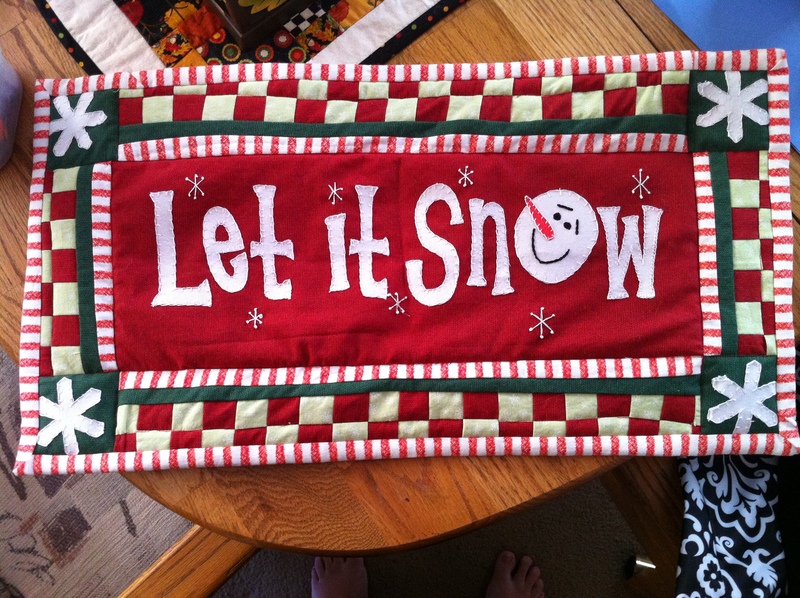 The letters and snowflakes are all hand sewn, as is the snowman’s face. It took me just a few days with an hour or two a day to get it all finished. Can’t wait to decorate for Christmas now! I’ll add some red ribbon to hang it from the wall. It is really lightweight, but so cute! It is going to be perfect for the season! Super simple! And it was a bit cathartic, too! Instead of cutting all of the strips, I just cut small notches in the fabric and ripped it the rest of the way. Very easy to do, but that ripping of fabric sure felt good! LOL! By the way, if you haven’t discovered it yet, I highly recommend you check out Pinterest. I am so addicted! It is an amazing site and more and more people are signing up every day. I love it because I can find a recipe or a craft or anything else I am interested in, pin it to my board and no longer will I have to sort through my bookmarks to find something I once saw online. Now, I have pictures and categories. And you can make friends, follow other boards, pin and like other things people post, and lots more. I love to use it to keep track of everything I want to do and wish I could do. You can find me here. And if you sign up, feel free to follow my boards or leave me a note on my blog or on Pinterest to say hello! Hope to see you pinning soon! I love your projects. 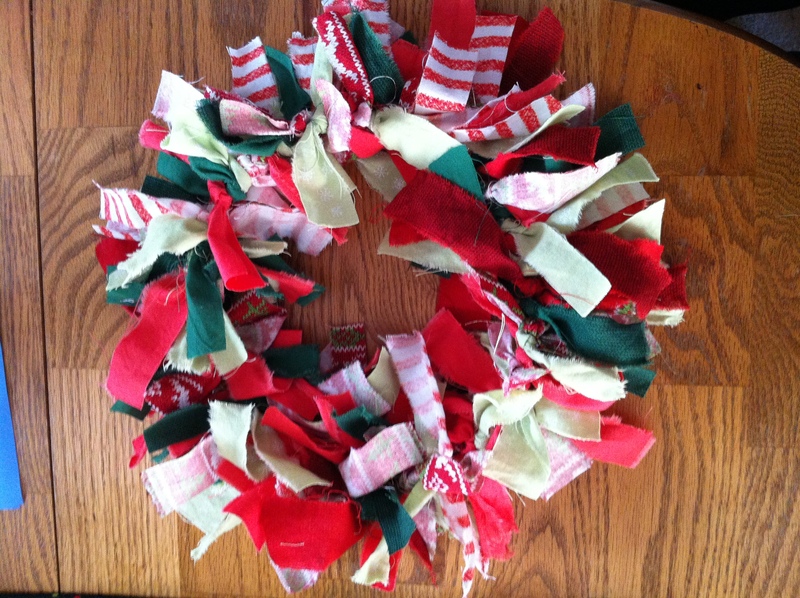 I keep wanting to do a wreath too. Is it time for Christmas already?? Oh also, your picture quality is really good. Whatever you’re doing it works for sure! Shannon – I finally was able to get some natural light in the house today! Usually we have NONE or I don’t photograph my stuff until the evening, but today I took advantage of the sunlight! Amazing at how much better everything looks!